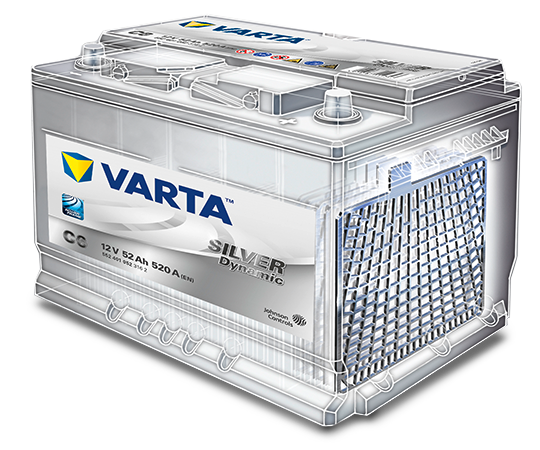 VARTA® offers a full portfolio of flooded lead-acid batteries that cover an extensive range of vehicles. Each battery is built to meet the specific needs of our global customer base of original equipment manufacturers and aftermarket customers. Flooded lead-acid batteries are the most common battery type. A liquid electrolyte consisting of sulphuric acid covers all internal parts. VARTA flooded bateries have a sealed construction, so that they are leakproof. Our flooded 12-volt batteries are engineered to support the electrical demands of today’s vehicles, providing reliable starting power time and time again in the most demanding climate conditions. They feature our exclusive PowerFrame® grid technology. We offer a full product portfolio of marine starting and deep cycle batteries, keeping our customers on the water longer. From high-cranking starting batteries to standard and enhanced deep-cycle flooded batteries, we have the right marine offering for any customer need. Unlike conventional flooded batteries, VARTA Professional Dual Purpose batteries are spillproof and can be tilted up to an angle of 90° for short periods. Starting batteries deliver sudden bursts of engine starting power. Deep-cycle batteries start engines and power accessories when the engine is not running. More durable construction with increased cycling capabilities, improving life in deep-cycle applications. Whether you need a battery to get you through multiple rounds of golf or reliable energy for industrial applications like scissor lifts or floor scrubbers, our golf cart batteries are built to provide the deep cycle performance you need. High-density active material and a specially formulated grid alloy that enables battery to withstand the stress of repetitive cycling. Ganged vents for convenient watering. Heavy-duty plate straps and tight element fit for vibration resistance. Envelope separators protect plates, provide superior cranking capacity and prevent internal shorting. Our heavy-duty, commercial-grade batteries are built for superior performance and increased cycling in challenging environments. PowerFrame® grid technology provides longer life, corrosion resistance and up to 70 percent better electrical flow. Maintenance-free vents increase battery life and prevent corrosion. Lead alloy-straps and anchor bonding increase vibration resistance. Integrated folding handles allow easy carrying and installation. Impact-resistant case with reinforced end walls for durability.